The DR-V1HD is a combined Linear PCM High-Quality Audio Recorder with HD Video. TASCAM has revolutionized broadcast and field recording for decades and with the release of the DR-V1HD here is another superior product from this consistent stable. Tascam has always been focused on creating easy to use, versatile products and with that in mind, they have developed an affordable AV recorder with some truly useful and useable features. For instance, the DR-V1HD has an all-in-one 180-degree rotating microphone and camera lens assembly at the top of the unit along with complementary feature sets and menu operations (e.g. 'White Balance' selections and still photography mode). The DR-V1HD is encased in a sturdy and solid structure with an ergo dynamic design. 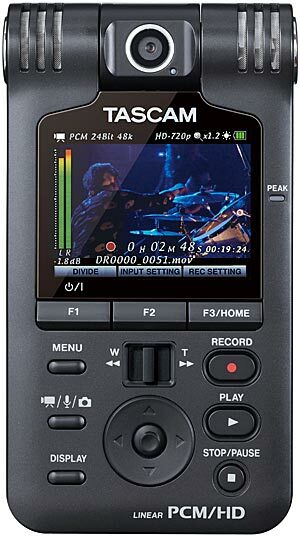 Tascam have continued their same sleek look as previously released handheld recorders and included the most popular traditional rotary level control for fine-tuned and quiet input level adjustments. The layout and control surfaces were designed to decrease any unnecessary handling noise and produce stable filming operation. Every fine detail was considered when Tascam constructed the DR-V1HD. The mic placement structure was designed to rid any possible electrical noise and it records up to 96k/24-bit audio. Amongst a host of practical features they have included their iconic 'Variable-Speed-Audition' as well as the ability to link any audio file on the device to still photographs. The DR-V1HD also has an HDMI out and a standard camera thread for use with a tripod. All in all, this AV recorder adds a distinct and important new addition to their wide range of popular handheld and field recorders. Having the option to rotate the microphones and camera front and back 180 degrees increases the possibilities for various camera angles and placement. The DR-V1HD maintains the same high-quality audio standards of the rest of Tascam's popular DR-Series recorders, having the same high-quality audio circuitry. Moreover, the AD/DA is Cirrus Logic’s acclaimed audio codec. 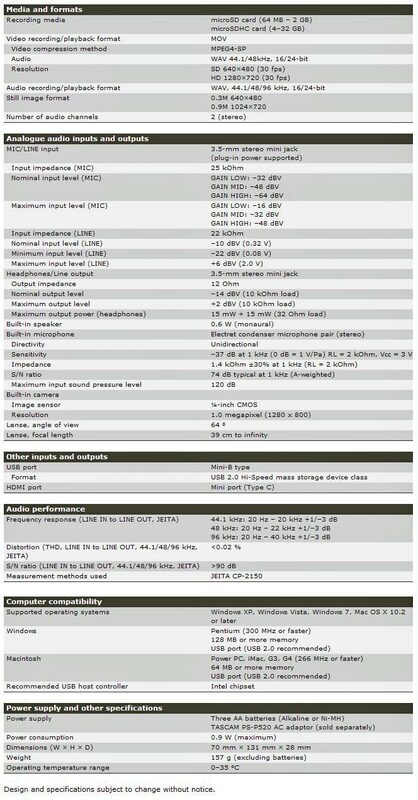 So no corners have been cut just because it's a video recorder as well - you can be quite sure of superior audio with the DR-V1HD. Tascam's popular VSA (Variable Speed Audition) is an integral function on the DR-V1HD - great for learning pieces. The DR-V1HD has three operation modes; movie, audio, and photograph mode. The photograph mode offers the ability to take still photos, view separately, view them in a slideshow and link any audio files on the device to a single snap shot. Powered by three AA batteries, the DR-V1HD (in HD mode) will capture up to 4.5 hours of continuous video shooting. In SD mode, the DR-V1HD will capture up to 5.5 hours. You can easily use the DR-V1HD in a variety of differing environments because it provides appropriate settings to accommodate your surroundings. 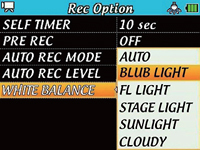 Options include white balance adjustments for 'Stage Lighting', 'Sunlight', and 'Cloud'. These settings result in your video recordings looking as natural and impressive as this remarkable recorder sounds.